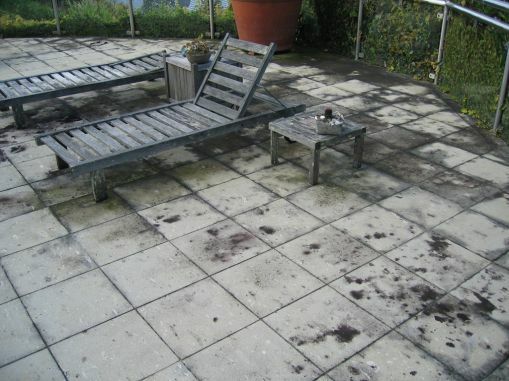 Mould on tiles, mould on stone and algae growth are most common on exterior areas with textured and /or porous tiles. Mould on tiles appears more in sheltered or southerly facing areas, or in areas under overhanging trees or shelter. The more textured the surface, the easier it is for mould spores to accumulate, grow and discolour. This can also be made worse by accumulated leaves and grime. Whatever you do, DON’T WATERBLAST. Waterblasting will push the mould spores further into the stone or tile, at the same time as opening the pore structure, so that the mould will grow back worse than before and be harder to remove. A Deep Dirt Extraction treatment will remove all mould spores on the tiles, even those that have penetrated into the surface. This should be followed by Stain-Guarding to limit the water penetration into the surface. Prevention of mould on tiles can be assisted by ensuring any water on the surface is well-drained, and regularly removing any accumulated leaves and debris with a coarse yard broom. Treatment with a slow release biocide can also prevent recurrence for a period of time. Unfortunately mould on tiles cannot be permanently and totally prevented in this type of environment. 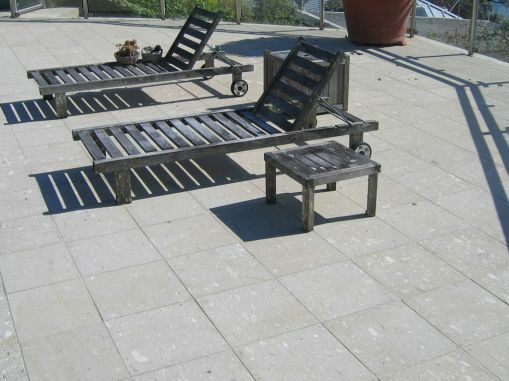 You might find it useful to read our How to keep your tiles clean guide for outdoor surfaces. If you have mould or algae growing on your stone or tiles, you can book a free Slique Consultation – we’ll come and confirm your problem, and give you a quote for our Technicians to professionally restore the surface to as-new condition.